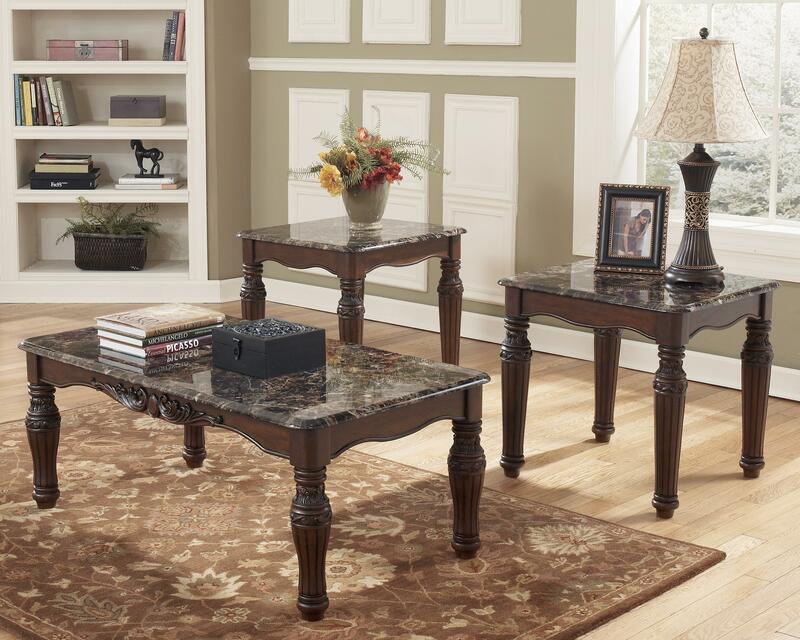 This North Shore rich dark brown finish traditional 3-piece occasional group includes one cocktail table and two end tables. The set comes together with durable faux marble table tops that are perfect for serving food when you entertain, turned legs, shaped aprons with overlay ornate Old World detailing to create the ultimate in grand traditional design that is sure to enhance any home’s beauty. The faux marble tops have a polyurethane finish for durability. Cocktail Table: 48"W x 26"D x 19"H.
Each End Table: 24"W x 26"D x 24"H.
The North Shore 3-in-1 Pack Traditional Occasional Table Group with Faux Marble Tops by Signature Design by Ashley at Furniture Fair - North Carolina in the Jacksonville, Greenville, Goldsboro, New Bern, Rocky Mount, Wilmington NC area. Product availability may vary. Contact us for the most current availability on this product.